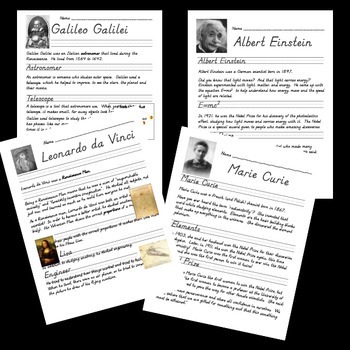 Each scientist has a full 1 page worksheet discussing who they were and what they did, where students have to write key words. Marie Curie also has a worksheet/activity where students use colored blocks (representing atoms) to build molecules (like water). Einstein has a worksheet where you measure the speed of light by melting chocolate in a microwave! With Galileo, I have the kids make telescopes out of paper towel tubes, and for Leonardo da Vinci, we traced students on large paper to create our own 'Vetruvian kids'. These are great, easy ways to introduce famous scientists to young children. The activities are fun and simple and help the kids truly understand what they're learning.